Gas and oil-fired boilers. Boiler controls, OEM and compatible parts, installation supplies and accessories, software and computer programs and thermostats. Oil-fired and gas-fired boilers. Hot water or steam heat. Replacement parts, controls, supplies, thermostats. Boiler-related software. If you are getting a new boiler installed, ask the contractor if it can be zoned to areas you spend more or less time in. There are hot water coils on the market that can be installed on an air conditioning or heat pump air handler. There are also indoor blower units using just the hot water coil as primary heat. hydronic heating:Heated water or steam that is transferred through a closed system of piping. There are several different types of radiant heat components (terminals) that can be connected to the piping. A few examples are radiant floor heat, radiators, convectors and forced air water coils. aquastat:A control used on boilers to regulate the temperature of the water used for heating and domestic water. The control has a low (on) and high (off) limit and a differential range setting. The differential setting determines the range of the low limit. The differential is set higher when the boiler is used for both heating and domestic water use and lower for heat only use. continuity test:Checking an electrical circuit to see if it complete (closed) or interrupted (open). In HVAC service, this is performed with an Ohm meter that checks for continuity and resistance. Electrical resistance is a measurement in ohms and shows the reduction in electrical current flowing through a part or wire. direct vent:Also known as power venting, this is a term for venting a boiler where a chimney may be nonexistent or impractical. Commonly piped in schedule 40 PVC pipe or steel tubing to exterior of building. Check with local building codes and manufacturer's specifications for clearances and materials. oil pump filter:A filter inside an oil burner's pump assembly that removes particles from entering the pump and nozzle assembly. Not to be confused with an in-line oil fuel filter. Tech Note: If the in-line fuel filter is seriously clogged; the pump filter most likely needs to be cleaned or replaced. flame sensor:Also know as a flame rod or detector on a flame rectification system. A device on a gas-fired boiler that proves "verifies" that a flame is present before the ignition control is powered to open the gas valve. Not to be confused with a thermocouple that senses a flame through a lit pilot that controls the gas valve. pipe sizing program:Software program used for determining the correct components and size of supply and return piping used in the design of hydronic systems. Correct pipe sizing is crucial for determining different types of radiant heaters and number of zones and loops in a system. diverting tee:An in-line pipe fitting used on a one-pipe hydronic system to overcome the problem of circulating hot water flowing directly back to the boiler without diverting to a terminal (e.g. baseboard heater, etc.,). two-pipe system:boiler term for the design of a single supply and a single return. Each terminal (e.g. radiator, etc.,) is connected by a supply and return branch to its main. This designs allows separate control to each terminal. A two-pipe system can be used for any properly sized application. expansion tank:A tank which compensates for the normal expansion of water pressures and temperatures in a boiler (hydronic) system. Some older tanks need to be drained annually. Modern tanks contain a rubber diaphragm, charged with air, that expands and contracts with fluctuating water conditions. An oil-burning boiler should have its exchanger cleaned every year. This directory contains an index and terms that will guide you to a specific hydronic (boiler) topic or item. 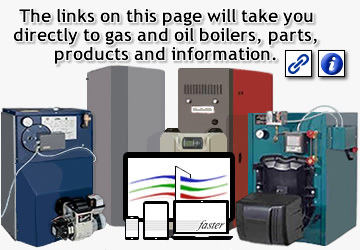 This web page focuses on hydronic steam and hot water systems. There are many uses for boilers. Some can provide domestic hot water all year long. Some boilers can be zoned to heat separate rooms at the desired temperatures. It can be zoned for radiant floor heating. It can be used for melting snow and ice on driveways and walkways. Some boilers can be attached to a heat pump or air conditioning system through a water coil. The heat pump configuration is wired with an optimizer to provide the primary heat from the heat pump. At a certain temperature, when the heat pump starts losing its efficiency, the boiler will initiate and provide back-up heat by circulating hot water through the water coil.